Is Lemon a Natural Diuretic? Bloating and water retention can add pounds to your frame and make you feel uncomfortable. Diuretic foods may help your body naturally release some of the water it's holding onto to reduce your symptoms. Although lemon is a great way to liven up a glass of water, there's no evidence that it acts as a diuretic. Consult your doctor before attempting to self-treat any medical condition. A diuretic is any substance that increase urination, helping flush water from your system. Your doctor can prescribe diuretics, called water pills, if your water retention is chronic or acute. Mild cases of water retention can often be treated with diet and lifestyle changes. According to the University of Maryland Medical Center, foods with diuretic properties include asparagus, parsley, beets, grapes, green beans, leafy greens, pineapples, pumpkins, onions, leeks and garlic. Lemon is not included in that list. The Better Health Channel website lists dandelion leaf, corn silk and horsetail as herbs with the ability to act as diuretics. It says cranberry juice may also work. Fitness expert and author David Grotto told the Fitness website that watermelon has diuretic properties. Adding diuretic foods to your diet can't hurt since they're all healthy foods rich in essential vitamins, minerals, fiber and antioxidants. The University of Maryland Medical Center also recommends reducing your salt intake -- a high salt intake is often to blame for water retention. Also increase your intake of foods rich in B vitamins and iron, including whole grains, dark leafy greens and sea vegetables. Cut refined foods like white rice, pasta and bread out of your diet and eat less red meat. Choose lean chicken and fish instead. Also be sure to exercise regularly. 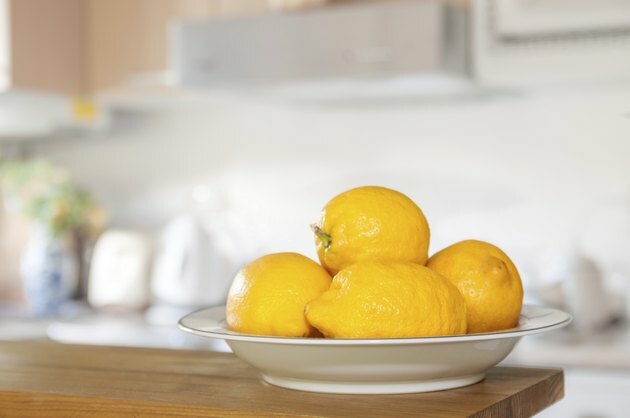 Just because lemon isn't a diuretic doesn't mean it isn't a healthy addition to your diet. It's a great way to flavor foods when trying to reduce your salt intake -- squeeze it over fish instead of salty marinades. Add the juice of half a lemon to a glass of water, and you'll get a generous amount of vitamin C and smaller amounts of B vitamins, potassium, phosphorus and calcium. A study published in the journal Stroke in February 2012 shows that eating more citrus fruits may lower a woman's risk of stroke. Does Drinking Hot Water & Lemons Make You Urinate More? Is Lemon Water Good for the Liver?